Technology and innovation: For example, industrial trawling is a technology that has drastically accelerated our ability to extract fish from the ocean, far outpacing the increase in number of fishermen. 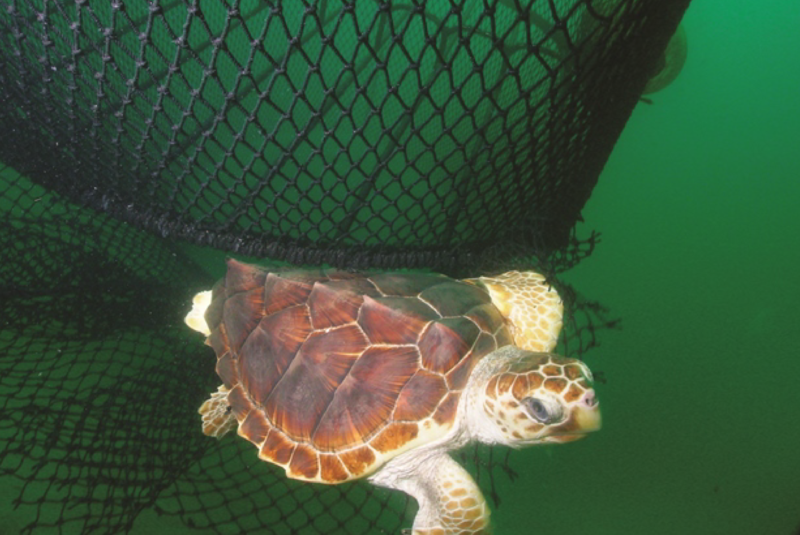 However, innovation in sustainable fishing gear, like fisher-designed “turtle excluder devices” that free sea turtles from shrimp nets, is key to reducing fishing impact while allowing fishermen to maintain their livelihoods. 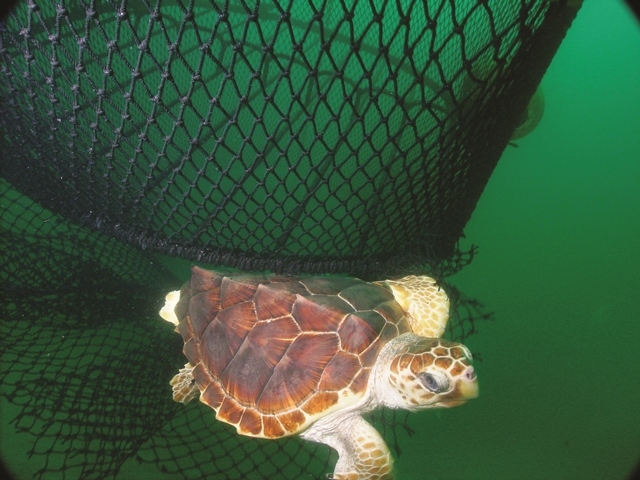 Conservation technology can reduce the impact of fishing: here, a loggerhead turtle escapes a net through a turtle excluder device. These devices are most effective and widely used when developed by or in partnership with fishers. Photo courtesy of Wikimedia Commons. Resource demand and distribution: A globalized economy expands economic opportunities, but also disrupts local food security and increases pressure on fish stocks. Disproportionate demand for seafood in a few developed nations, particularly the US, EU, and Japan, drives increased fishing effort worldwide. Meanwhile, exploitative trade agreements may allow distant fleets to fish with impunity, at the expense of local, subsistence vessels—this has been seen with agreements between the EU and sub-Saharan West Africa, where limits on number of vessels but not catch allow industrial European ships to far outcompete less developed local fleets. Poverty, marginalization, and equity: Inequitable social structures that impoverish or marginalize fishers may leave them with no other recourse but unsustainable fishing behaviors, a “social-ecological trap.” Researchers have found that younger and poorer fishermen, who lack access to credit, other gear types, or other income sources, are more likely to use fishing gear that harms reefs or catches juvenile fish. Governance and management: Insufficient or corrupt management may allow a few fishers to overextend stocks. Government subsidies, for instance, may encourage fishers to continue to exploit stocks despite signs of scarcity. On the other hand, many fishing communities responsibly manage their own resources. 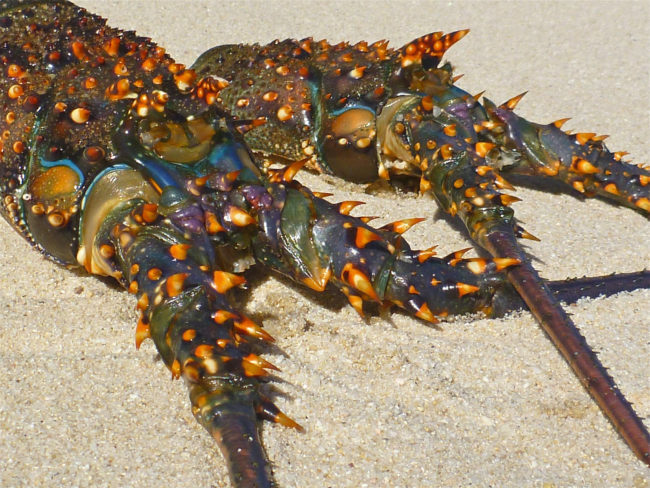 The Baja, Mexico lobster fishery achieved Marine Stewardship Council certification for its strict community-based standards to fish below national quotas and using their own funds to patrol their coastline, resulting in decades of stable catch. Good management is another way to curb overfishing while maintaining fishing jobs. In Baja, Mexico, there is a strong community-based effort to sustain the lobster fishery. Image by Steve Jurvetson, CC BY 2.0. These drivers of overfishing can be addressed with direct policy levers that may be more effective and less ethically ambiguous than reducing fishing effort by restricting fishing access or controlling the population. If destructive fishing technology is the issue, incentives for innovation, particularly involving fishers in the development process, may be an appropriate solution. Developing nations dealing with exploitative foreign industrial fleets may need to enact policies to ensure local food security, such as limiting leases for foreign vessels, effectively enforcing regulations and boundaries, and addressing equitable allocation of fishing rights locally. Incorporating human rights goals into fisheries management may help address issues of poverty and marginalization. Finally, support for local institutions and efforts to include fishers in decision-making, enforcement, and monitoring could foster strong fisheries governance.